This East Africa Adventure Tour takes you along some of the biggest highlights in East Africa. The tour starts at one of the 7 natural wonders of the world- Victoria Falls in Zimbabwe and heads North to Nairobi in Kenya over 21 days. 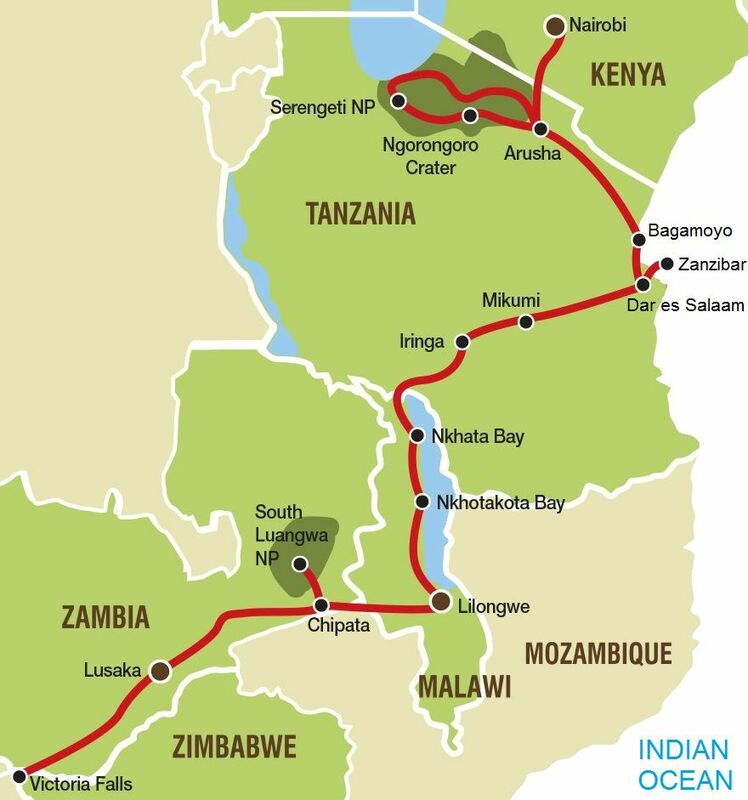 We travel through Zambia, Malawi, Tanzania and end in Kenya. Highlights will include South Luangwa National Park, Lake Malawi, Zanzibar Island, the Serengeti National Park and the Ngorogoro Crater. Our East African Adventure tour (North) begins as we set off early from Victoria Falls when we catch a last sighting of the mighty falls before crossing the border into Zambia. While we have a long day travelling today, we get our first impressions of the Africa that awaits us. Colourful markets, busy villages and rural scenes form the backdrop of our journey to the outskirts of Lusaka. We enjoy a prepared meal on arrival as our guides brief us on the days ahead. After crossing the border into Kenya we continue to travel towards Nairobi. Founded by the British in 1899 as a simple rail depot, the town quickly grew to become the capital of British East Africa and eventually the capital of Kenya in 1963. Usually we enjoy a group meal out at one of Nairobi’s excellent restaurants. Your tour ends upon arrival in Nairobi.